Should Your Soft Serve Be Vegan Friendly? 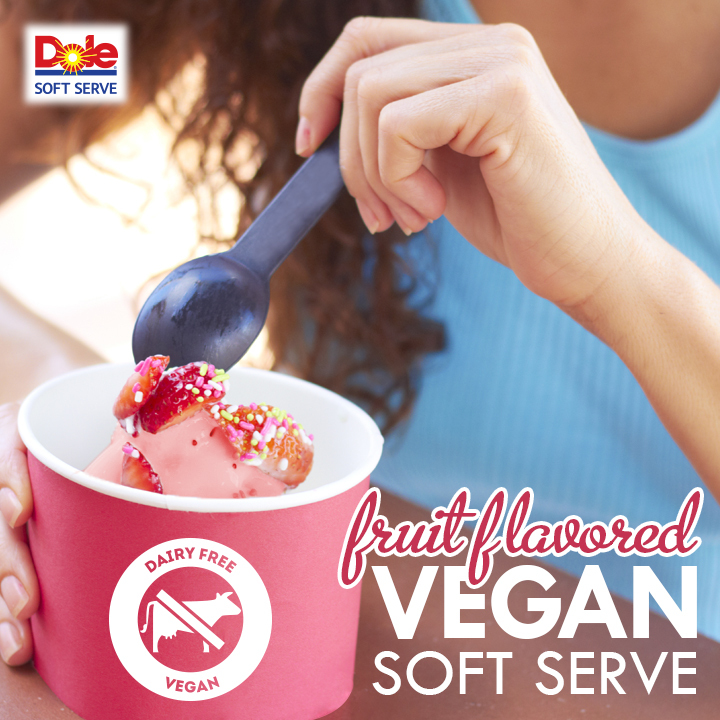 We tell you that DOLE Soft Serve fruit flavors are vegan, but what does that mean and who really cares? First, you might be surprised but veganism, the practice of abstaining from the use of animal products including eggs and dairy, is growing in popularity. Former president Bill Clinton has taken up the lifestyle as well as celebs like Usher, Ellen, Mike Tyson and Alanis Morissette among others. Vegan Disney World helps other vegans find places to eat at Disney Parks. Tell us a little about “Vegan Disney World”. Vegan Disney World is a blog created by two vegans who found it difficult to know what was vegan in Disney World. We thought that other people were probably in the same situation as us…not knowing what foods are vegan throughout the parks. We decided to create a blog to function as a database for other vegans to find where they can eat. We also feature reviews and tips about our experiences in the parks. Why do you think it is important for people to eat vegan? We believe all lives are equal, we don’t feel that we need to eat animal products to sustain a healthy life. If more people showed compassion to animals the world would be a better place. We also feel that being vegan benefits the environment because of the waste that factory farming creates. How difficult is it to follow a vegan diet? What are its biggest challenges? We personally don’t find it hard to follow a vegan diet, with that said we know being vegan isn’t for everyone. If we can just make people aware of the amount of vegan foods that are available to us then maybe people will adopt a low meat diet or even switch to veganism. We both loved cheese before we went vegan, but luckily there are so many substitutes for ‘non vegan’ items that it is incredibly easy to eat vegan. You can even get a vegan cheese pizza from Pizza Planet in Hollywood Studios! Are you optimistic about the future of veganism in foodservice? What changes have you seen in the last few years and what do you anticipate over the next five? Yes, in the years we have been vegan, we have seen a rise in vegan items at the grocery store and in Disney World. When we first went to Disney together in 2012 we basically lived off of veggie burgers and french fries. Now we can enjoy Dole Whip Floats, samosas, pizzas, Gardein based meals and many other items just on Disney property. I can only imagine what kind of vegan options I will see in the future, vegan substitutes have come a long way and I think people are becoming more aware of their food and where it comes from. The more we demand of good healthy options, the better options we’ll see. Any advice for a new vegan? Don’t give up, try eating some the vegan substitutes of your old favorite foods. Don’t eat those all the time but they can do a huge help in your transition to veganism. Do it for the right reasons, if you choose to eat vegan because of compassion for animals you will find it very easy to cut out animal based products. As a whole, veganism might not be reason enough to change your menu but when you break it down, you’ll see it isn’t something to ignore. The most recent data we found came from a Gallup poll in 2012 and reported 5% of Americans identify themselves as vegetarians and 2% vegans. This potentially translates to 6 million vegans and 15 million vegetarians that visit restaurants and frozen yogurt shops across the USA on a regular basis. Aside from this group not wanting to harm animals, many vegans and vegetarians adopt a plant-based diet because they believe it will help them live longer and prevent diseases like heart disease and cancer. Another benefit to this restricted diet is the component of healthy weight maintenance. Meats and dairy are higher in calories and fat; eliminating these foods allow people to eat with less calorie counting and worry. One catch…Although our mango, strawberry, raspberry, pineapple, orange and NEW lemon flavors are classified vegan; the actual “swirl” is up to the operator and their preparation. Our mixing instructions suggest using water, however, some operators may add additional ingredients. In order to keep DOLE Soft Serve vegan and dairy-free, all that is needed is water. If any other ingredients are added (ex. soda, milk, live or active cultures, alcohol), we cannot guarantee the finished product is classified “vegan”. Be sure to ask the operator about prep methods if you are concerned. We’re optimistic that you’ve found our blog searching for vegan soft serve. If we’re right, please leave us a comment and we’ll ship you samples. Only requirement is a soft serve machine!